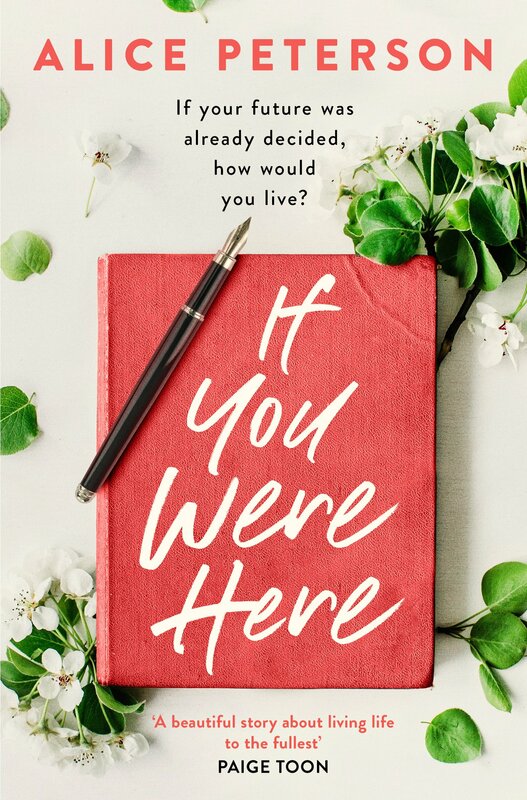 Author of tear-jerkers and emotional rollercoasters, Alice Peterson has revealed her new book for 2019 called ‘If You Were Here’. When her daughter Beth dies suddenly, Peggy Andrews is left to pick up the pieces and take care of her granddaughter Flo. But sorting through Beth’s things reveals a secret never told: Beth was sick, with the same genetic condition that claimed her father’s life, and now Peggy must decide whether to keep the secret or risk destroying her granddaughter’s world. Five years later, Flo is engaged and ready to pack up her life and move to New York with her high-flying fiancé. Peggy never told Flo what she discovered, but with Flo looking towards her future, Peggy realises it’s time to come clean and reveal that her granddaughter’s life might also be at risk. As Flo struggles to decide her own path, she is faced with the same life-altering questions her mother asked herself years before: If a test could decide your future, would you take it? An emotional, inspiring and uplifting novel about living life to the fullest, ‘If You Were Here’ will break your heart and put it back together. You can pre-order ‘If You Were Here’ from Amazon and will be available from good bookshops from 22nd August 2019. With being based in Northern Ireland, I sometimes miss out on book events, so when the lovely Sara Jade Virture from Books and the City invited me to their Spring Bloggers event, I literally jumped on a plane. It was a wonderful evening, packed with fellow book lovers and some of Books and the City authors and we got the chance to hear extracts from Iona Grey’s new book called ‘The Glittering Hour’, Alice Peterson’s ‘If You Were Here’, Claire Frost’s debut novel called ‘Living My Best Life’, Milly Johnson’s latest book ‘The Magnificent Mrs Mayhem’ and Rachel Hore’s new book ‘The Lost Child’. As well as the delicious readings, we were also given proofs of Paige Toon’s new book called ‘If I Could Anywhere’ as well as Catherine Isaac’s new book called ‘Messy, Wonderful Us’. As per usual Sara Jade’s goodie bags were a delight filled with samples from upcoming books, sweetie flavoured shower gel as well as beautiful book themed necklace and who can forget the cupcakes! It was also lovely to chat to Louise Candlish about her hugely successful book called ‘Our House’ as well as meet Heidi Swain, Juliet Ashton and Alice Peterson, as well as I finally got a photograph with Milly Johnson. A huge thank you to Sara Jade and the Books and the City team for organising a wonderful evening and the generous gifts. Christmas is nearly upon us and I’ve found myself writing my annual sign off instead of wrapping presents that are still in their bags. Last minute as always! This year was a great year for books and I’ve even listed my top ten books for 2017, just incase you are looking for a few last minute stocking fillers. It was also a great year for Handwritten Girl, as I attended the Bord Gais Energy Book Awards for the first time and had an amazing time meeting some of Ireland’s finest literary talent ans well as spending Halloween weekend learning about the dark and interesting world of crime writing. 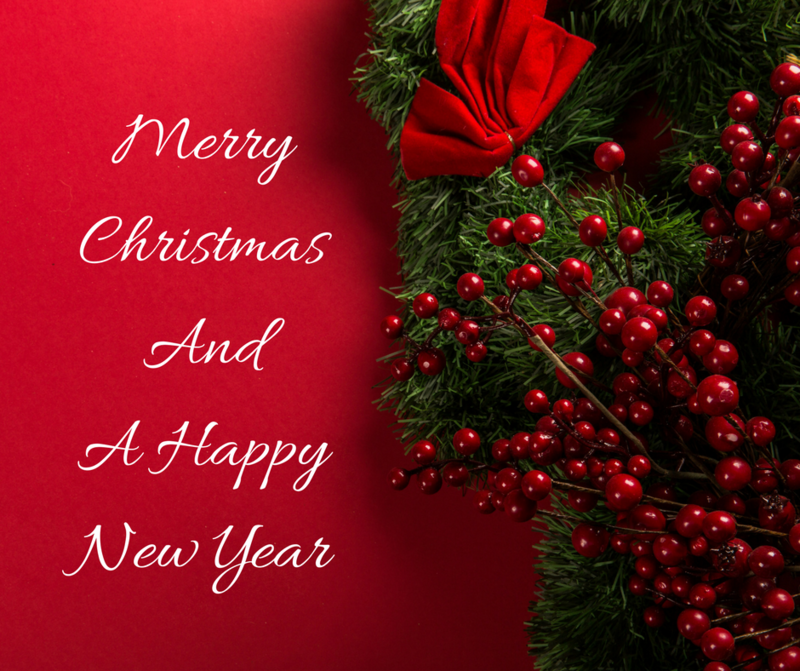 Before I sign off, I would like to say a huge thank you to all the lovely publishers and authors who introduced me to some of the most wonderful books this year, from intense thrillers to happy romances, there’s something for everyone to curl up with during the cold winter nights. Most importantly, thank you to the readers of the website for taking the time to read a review, tweet, Favourite or Like a post, your support is appreciated tremendously. I hope you all have a safe and relaxing Christmas and receive loads of treats from Santa Claus, especially books as there are some great ones out there. Have a Happy New Year and I shall see you in 2018. Handwritten Girl’s Favourite Books of 2017. ‘A Song For Tomorrow’ is the latest book by Alice Peterson. Tom fell in love with Alice the moment he saw her. He realises that being with her will not be easy, but she is a force of nature, a burst of sunlight in his otherwise ordinary world.Some people might look at Alice and think she has everything, but Alice knows she is not like other women. Her life is complicated, unpredictable, difficult. Alice does not like pity. All she wants to do, has ever wanted to do, is sing. Alice has been told not to follow her dreams. So has Tom. But when fate has already dealt a tough hand, it’s time to stop listening to everyone else and only follow their hearts. This book is Alice’s first book with Simon and Schuster and it’s a breathtakingly beautiful start with her new publishers. The story is about Alice Martineau, a young woman who suffers from cystic fibrosis and follows on her journey as she intends to follow her dream of becoming an established musician as well as fall in love. The story flows over a period of years, from Alice’s birth to all the monumental moments of her life, sickness, relationships and the times that she got to perform. Like Alice’s previous books, this book is an emotional rollercoaster, the story is true and for this reason, makes the tale particularly poignant. Alice is a beautiful character, she’s wise beyond her years, having lived a difficult life, in and out of hospital, she tries to see the bright side of life and refuses to let her illness define her. The story is primarily seen through the eyes of Alice but there are chapters seen through the narrative of Tom, Alice’s boyfriend as he also deals with Alice’s illness and the uncertainty of their future together. An interesting addition to the story, is diary entries from Mary, Alice’s mother, who gives a mothers perspective on the daily struggles, the fear of outliving her child as well as the proudness of watching her daughter overcome Cystic Fibrosis to achieve her life long dream. This story is about determination, that if you battle and work hard, you will get the results you wish for. It’s an aspirational story that is truly an inspirational and motivating and was impossible to put down. With every tear jerking moment, there is a lighter scene that made me smile, even though the story did break my heart. As the story is completely true, it makes for terribly sad and gripping reading, to read about such a vibrant young woman who is powerless to this awful illness, that there is still no proper cure for and try to lead a normal and fun life, be limited to in her life. 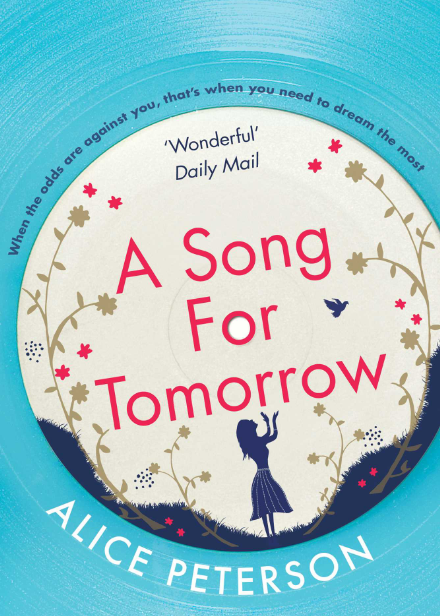 ‘A Song For Tomorrow’ is a tremendously inspiring story about a remarkable woman who refuses to be defined by her illness, courageous and witty from the beginning, this book is truly Alice at her finest, telling a wonderful story about an inspirational figure and highlights the importance of organ donation and making the most of every day. I loved it, but be warned, have the tissues close to hand. You can pre-order A Song for Tomorrow from Amazon and will be available to buy from good bookshops from 9th February 2017. ‘The Things We Do For Love’ is the latest book by Alice Peterson. Alice Peterson has become an author that I am beginning to dread to read, not that I don’t enjoy her books, but they always leave me in a bawling mess, scrambling frantically for the tissue in the pits of bag and ‘The Things We Do For Love’ was certainly no different, it was an emotional roller coaster of a story, that barely let me catch my breath. The story is told solely through the eyes of uniquely named January Wild, a young woman who has suffered a lot of sadness her life. When her parents are tragically killed in an accident, herself and her older brother Lucas are left in the care of their grandparents who provided the children with all the love and support that they could ever wish for. The story flashes through present and times in January’s life, when moments are particularly hard when she meets the love of the her life who breaks her heart, when she discovers that that she is going to be a single parent and that heartbreaking moment when she is eventually told that her little girl Isla, has Cerebral Palsy. The one thing in her life that is going well is her job as a PA in a well known estate agent until her boss retires bringing in a new manager called Ward Metcalfe, a cold and driven man who riles January up the wrong way, yet as the pair begin to work closer together, January begins to see a different side to her boss, a side that he keeps hidden from everyone else. January was a beautiful lead, struck down so many times so unfortunate incidents, she stays strong for her little girl and longs for nothing more than her daughter to have a normal life and not to looked at with pity or sympathy. There are heartbreaking moments in the story when January talks of her fear for daughters well-being, how she wishes her life was different and these tender and open scenes make for tearful reading. She is a strong and independent woman who has been through so much but always comes out fighting. Her daughter, Isla is a bright and bubbly girl and tries not to let her illness consume her life, she witty and creative and the scenes with her and January are also sweet moments. January’s grandparents also made for interesting, significant roles in the story, despite their age, they were always there for the children and never judged January when she realised that she was pregnant and single. instead they were there for her every step of the way. Alice’s previous books have tackled sensitive issues such alcoholism and paralysis and this book was no different, tackling the disability Cerebral Palsy and the stigma that goes with it. One of the many things I loved about this book, was the timescale in which it was cleverly written. It would fleet between past and present moments, which had some important meaning in January’s life and this was always clearly marked, so you never got muddled up in the story. A honest and eye-opening story from the very beginning, ’The Things We Do For Love’ is a compelling book that I found impossible to put down. Tearjerking and uplifting in equal measures, this tale is not a conventional love story, it’s an inspirational story about finding love for yourself and then letting yourself to be loved. 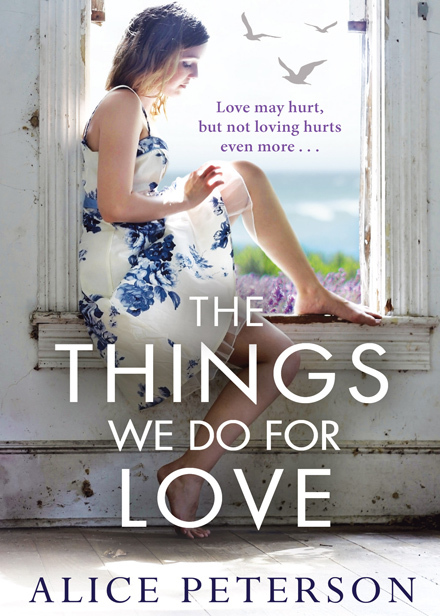 You can pre-order The Things We Do for Love from Amazon and will be available to buy from good bookshops from 10th September 2015.